Canotia, published by the Arizona State University Vascular Plant Herbarium (ASU), is a journal devoted to botanical and mycological papers. 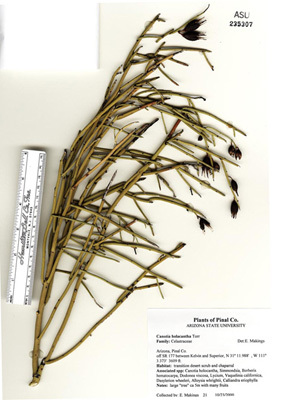 These may include contributions to the Vascular Plants of Arizona (VPA) project, checklists, local floras, new records for Arizona and ecological studies. All manuscripts are peer-reviewed by specialists. Acceptance for publication will be at the discretion of the editor. 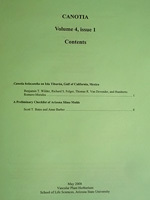 At least 30 printed copies of each issue are distributed to libraries in the United States, Europe, and Latin America. Anyone may download copies free of charge. 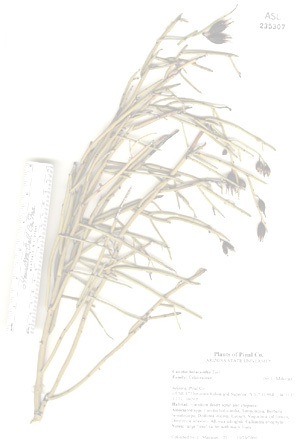 The Arizona Native Plant Society continues to provide financial support for printed copies of issues that include contributions to the Vascular Plants of Arizona project [e.g., Vol. 1(1), Vol. 2(1), Vol. 3(2), Vol. 4(2)]. Canotia is named for Canotia holacantha Torr. (Celastraceae), a spiny shrub or small tree nearly endemic to Arizona.